hope you like thanks for looking...off to do a link lol!!! Sassy, this is so pretty and feminine, your daughter will love it. I'm lost for words at the card you have posted over the last few days...WOW, WOW and an extra big WOW!! Oh my word Sassy this is a wonderful creation the colours the centre piece are just wow. This is absolutely gorgeous!! Love it!! Wow Sassy this is stunning so soft & floaty, my middle child was born the day before my B/day too it makes us a bit more special & closer. 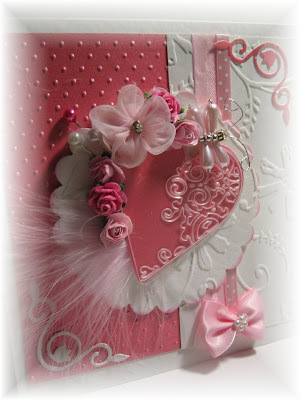 Wow Sassy, this is so gorgeous and feminine and pretty, I love it! The heart with the embossed plastic looks amazingly beautiful especially surrounded by those beautiful flowers, feathers and pins. And great envelope too! Your daughter will love to receive this I'm sure! So glad you decided to play along with us at www.cuttlebugchallenge.blogspot.com! WOW! What a stunning card! Love all the detail! Thanks for playing along at The Cuttlebug Spot! Sue this is just Beautifull, must go have a nosey at the challenge as i got a cuttlebug for my birthday only got 2 folders and ones the spot. This is really beautiful! 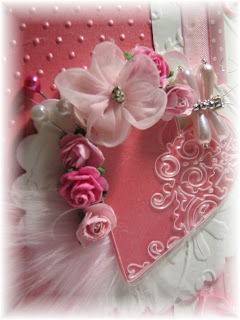 I love all the feminine details and touches to it! Great job with Be Inspired 29! So many lovely details. Thanks for joining in on this week's Cuttlebug Spot Challenge. This is absolutely gorgeous! The detail on the heart is stunning! Well done! Spectacular! I love all the little details! Thanks for joining us this week at The Cuttlebug Spot! Pretty, pretty, pretty! You make such a fabulous job of these extremely beautiful creations. How do you adhere the acetate over the coloured card invisibly? Wow, stunning and so beautiful. I just LOVE, LOVE all of your cards. Wow, stunning card, absolutely gorgeous! JUST BEAUTIFUL! 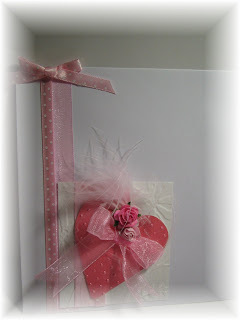 a VERY LOVELY PRETTY IN PINK CARD. SO MANY DETAILS!!! Wow! All those details are just fab!